In the ultimate years of the Soviet Union, as the liberalizations introduced by perestroika and glasnost took full effect, the nationalistic convictions of historically discriminated territories within the Russian and Central Asian region began to replace the ideologies of the USSR. Although the global community first applauded nationalism as an important force that debilitated the Soviet Union, social developments over the past twenty years have exposed the polarizing effects of the regions’ diverse ideologies. Since then, an inherent intolerance for Muslims has been embedded within the foundation of the country’s national identity. The recent influx of Muslims, precipitated by stagnant development in the Caucuses and Central Asia, have highlighted and reinforced the ideal that Muslims pose as an inferior, yet dangerous “other” in Muscovite society. Paradoxically, Moscow’s economy has become increasingly dependent upon an “outsider” workforce that many of its citizens hold a prejudice against; thus, the Russian government must soon find a way to alleviate the bitter animosity between Muslims and ethnic Russians within Moscow, as a permanent change in the capital’s demography is inevitable. The role of the “other” is not an unfamiliar aspect in Russian society, and much of this enmity towards outsiders is depicted in the political strategy of the Soviet Union. The USSR held a prejudice in favor of Russian culture, and instead of appreciating the ingrained diversity of their vast empire, the government marginalized its peripheral territories. The Soviet Union had claimed that its ideologies rose above nationalist convictions; however, the government and elites only represented a portion of the population— ethnic Russians. Shireen Hunter, in her work Islam in Russia explains, “Ethnic Russians were assigned a civilizing role of the ‘elder brother’ toward the Non-European populations of the Soviet Union…Most official business was conducted in Russian and few high ranking or members of the intelligentsia in non-Native republics were fluent in their native language.”2 The dichotomy between ethnic Russians and minorities was omnipresent in Soviet society. The USSR claimed their “Sovietization” strategy was a means to unifying their lands; however, “Sovietization” was by substantial measures “Russification” and it instead created a national consciousness felt by other cultures. This awareness only grew stronger and once the Soviet Union began to enact liberal reforms in the 1980s, national recognition burgeoned throughout the region. Although there has been noticeable improvement in the standard of life since the tumultuous days subsequent to the regime's fall, the polarizing effect of nationalism continues to pose a threat to regional stability. Thus, nationalism resuscitated the differences that the regime had attempted to weaken, creating a deep rift between cultures. This was evident in the rising number of ethnic conflicts that plagued the region, such as the Nagorno- Karabakh War and turbulence in nations such as Ukraine, Uzbekistan, and Kazakhstan. Thus, as the Soviet Union disintegrated, regional power driven by nationalism formed the foundation of the new sovereign states. The ambiguity between Soviet culture and Russian culture called for new analysis of national identity for Russians, resulting in a revival of certain aspects of the Russian narrative. One of the most important reevaluations was that of the significance of the Russian Orthodox Church. Russian Orthodox Christianity, which was imposed by Prince Vladimir the Great at the outset of the eleventh century, is an integral aspect of Russian and Russian history; as nationalistic ideology fortified, religious ideology rejuvenated as well. Orthodox Christianity prejudice claimed that “Catholics, Muslims, Protestants or Jews can only be Russian subjects…they even can be given certain civil rights, but since ‘Holy Russia’ is meaningless for them, they cannot be true Russians.”6 Therefore as Russian nationalism grew stronger, so did the idea that Orthodox Christianity was the superior religion in the land. In addition to the strengthening of the Russian Church, vital consequences of Russian nationalism included the formation of the “other.” As Russians addressed the concept of who they were, this inadvertently attended to the theme of who they were not. Hunter explains, “The process of identity formation includes the setting up of boundaries between ‘us’ and ‘them,’ between internal and external enemies and friends, by a process of exclusion and inclusion.”7 This exclusiveness has had numerous consequences concerning the integration of outsiders in Russian society, as it alienates communities that do not pay homage to Russian history. Instead of creating an all encompassing identity, the policies of the USSR reinforced the differences between muscovites and ethnic minorities. The ideology of the “other” has had negative consequences experienced by most minorities attempting to integrate into Russian society; however, Muslims—from Central Asia and Russia-- have been affected the most by this exclusiveness.8 The majority of the Islamic population is native to lands on the periphery of the Federation as well as nations bordering Russia. Consequently, Muslims within this region do not pay homage to the Russian and Muscovite narrative and instead adhere to diverse customs and ideologies. Furthermore, Islam as a whole has been historically perceived as an inferior, yet dangerous entity to Russian society. Ethnic Russians and Muslims have had a contentious history with one another, dating back to the era of the Mongols. The Mongols ruled the region between the thirteenth and sixteenth centuries and therefore many Russians blame the Islamic Mongols for Russia’s passivity towards the developments of the European Renaissance and for Russia’s tyrannical past. Hunter explains, “Most Russians and other Western historians dismiss any positive contribution of the Mongols to Russia’s cultural development because they believe the Mongols did not have much to contribute.”9 Thus, associated with its Mongol past, Islam has been a scapegoat for the misfortunes in Russian history. This highlights the absence of a strong common identity between Muslims of the region. Despite this, there has been an incessant uneasiness among Russians that the neighboring Turks will spread their influence and consolidate Islamic forces in the region. A number of developments, “such as the establishment of the Assembly of Turkic Peoples in 1991…help solidify these fears and are manipulated by ultra-nationalists.”11 The influence of these two notions highlights the complicated relationship Russia has had with the Muslims’ circumference around the Russian Federation, thus leaving the religion as the hostile “other” ill-fated to reconcile with Russian nationalism. The animosity towards Muslims in Russia has worsened over the years, and much of this tension can be attributed to the Chechen conflicts and recent terrorist attacks, such as the Moscow Theatre Crisis, that have assailed upon the capital. The Chechens and Russians have had a violent power struggle over the Northern Caucuses dating back to the disintegration of the Soviet Union. 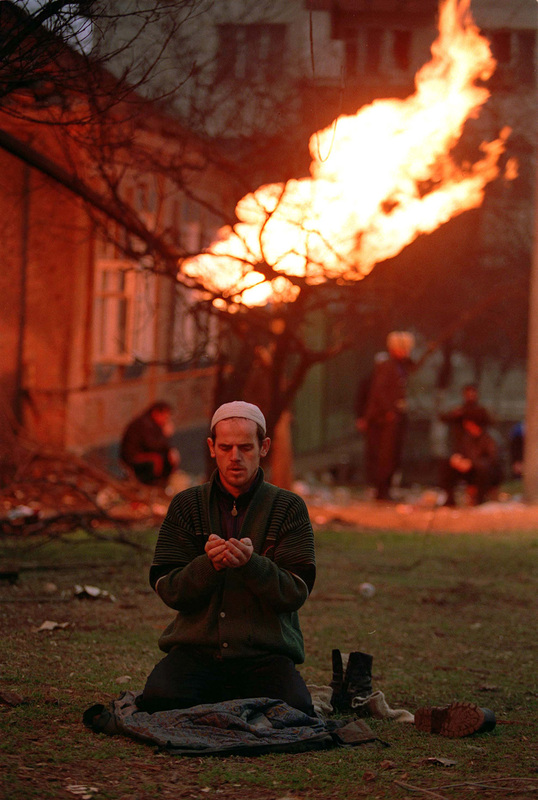 Although the demonization of the Chechens is its own separate issue for Russia, Islam as a whole has fallen victim to the violence in Chechnya, as “the Islamic factor was blown out of proportion; the fundamental concepts of Islam were distorted; and extremist ideology was extrapolated to the entire Muslim tradition.”14 In order to suppress the Chechens, Putin has “linked this fear of Islamic terrorists to the deep-seated Russian prejudice against the Chechen criminality.”15 Thus, in an attempt to demonize Chechens, Putin has also damaged the reputation of Islam as a whole. Many Russian nationalists believe their history renders them irreconcilable with Islam, and this notion is the foundation for understanding the negative reaction that Muslims faces as they migrate into Moscow. The recent influx of Muslims into the urban areas of Russia has provoked Russian nationalists to fill the streets and defend their cities against Muslim outsiders. However, Russian nationalists fail to understand the contradiction in their intolerance, as the output of the outsider workforce now makes up a vital portion of the Russian GDP. Thus, Moscow has become dependent on the immigrants that many nationalists hold prejudices against. 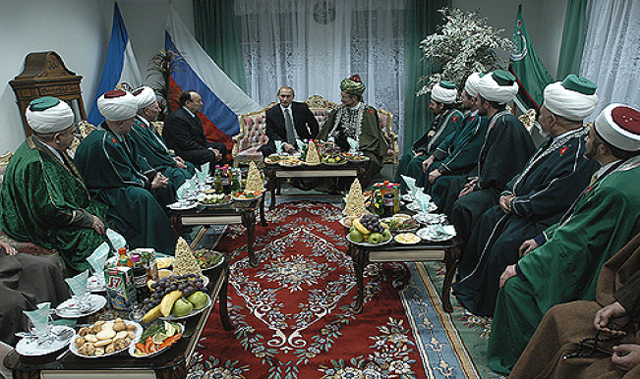 Putin in a meeting with supreme mufti Sheikh-ul-Islam Talgat Tajuddin, chairman of the Central Muslim Board of Russia and other religious leaders. The dynamics of the Muslim population within Moscow prior and post the Cold War reveal very different demographics. Moscow’s Muslims were geographically concentrated and ethnically homogenous prior to the breakup of the Soviet Union and the subsequent waves of migration into the capital. The population was “relatively small, well integrated, and Tatar dominated”16 and had historical ties that reach back to the fourteenth and fifteenth century. While the Muslim inhabitants currently make up approximately 14% of the Moscow community17, the 1989 census reports that these Muslims accounted for 1.8 percent of the capital’s population.18 Thus, because the Muslim residents crafted a small portion of Moscow’s demography, the Muslim Tatar community was relatively assimilated within society and not viewed as a threat within the city. Thus, this “economic prosperity” failed to trickle down to form a middle class. For example, by 2004 the GDP per capita in Tajikistan “was 1/15th of that in Russia, showing the extreme differences between the wealthiest and the poorest of the CIS countries. This clearly shows that salaries in Russia, while low by Russian standards, might improve the living standards of a family in Tajikistan significantly.”20 In 2013, the GDP per capita of Russia was $14,037, while that of Tajikistan and Kyrgyzstan was $871 and $1,160 respectively.21 Thus, the gap between Russia and its Muslim neighbors has not diminished in the past ten years. Unemployment statistics further highlight why Moscow is a palatable destination for those in the Central Asian and Caucasus region looking for work. The capital boasts an unemployment rate of less than 1% and the city continues to produce nearly a quarter of the country’s GDP.22 Within the Russian Federation, the urban economic boom can be felt in peripheral regions, where many citizens residing in these areas are enduring rates of high unemployment. While nearly everyone is employed in the capital, Chechnya’s unemployment rate in 2012 was 30%.23 This has contributed to the flow of “outsiders” into the city. The influx of workers into Moscow is directly correlated to the rise of Muslims in the city, as Islam is dominant in these regions. Distribution of Islamic populations. The concentration of muslims in regions of the caucasus is seen as a challenge to Russian nationalism. As stated, the new Moscow work force has its origins in Central Asian and Caucuses, regions that are predominantly Muslim. The Islamic population of Moscow “now numbers over thirty nationalities, with particular inflows from Azerbaijan, Chechnya, Tajikistan, and Uzbekistan.”24 The number of Muslims in Moscow is difficult to quantify, because certain migrants from the Central Asia region illegally inhabit the city. Citizens of Uzbekistan, Tajikistan, and Kyrgyzstan can remain in the country for 90 days without a visa, and a year with work authorization; however, many do not depart when they are supposed to. As of March 2012, calculations have estimated that more than two million Muslims now populate the city, hundreds of thousands of whom are illegal migrants thousands, meaning the Muslim residents now account for approximately 14% of the population.25 In this way, Moscow now hosts a combination of indigenous Tatar population of Muslims, legal Muslims from the peripheral lands Russian Federation, and a mixture of legal and illegal Muslims from the bordering countries in Central Asia. However, nationalists do not acknowledge this diverse demographic make-up, as many classify the entire Muslim population as “others,” regardless of whether or not they possess a Russian passport. Instead of taking measures to alleviate the tension between the outsiders and ethnic Russians, Sobyanin has only exacerbated the bitterness. He additionally declared Moscow would prohibit the construction of any additionally mosques, which now numbers at a paltry four. These statements and actions further underline the fact that Muscovite traditions pay homage to the Russian narrative, which alienate even those living in Russia that do not follow Muscovite customs. The mayor has remained quite unhelpful in the attempt to assuage the tension between nationalists and migrants, which has only further escalated the level of violence within the city. Nationalistic violence has has also risen in the past months, and this disorder was highlighted in the October 2013 murder of Yegor Shcherbakov. An ethnic Russian, Shcherbakov was stabbed to death by an Azeri Muslim migrant, triggering “Russia’s worst race riots in three years near Moscow’s southern Biryolyovo district.”31 Police set up metal detectors at the entrance of Moscow’s main mosque and detained over 1,200 migrants at a market in Biryolyovo. The entire Muslim populace was held responsible for the action of one migrant. These actions highlight the animosity held by Russian Nationalists, and how Islam repeatedly takes the role of a scapegoat in Russian eyes. Without this workforce, it would be nearly impossible for Moscow to maintain their current levels of economic production, as these migrants hold a large number of low paid, but crucial jobs. In addition, the birth rates of ethnic Russians has decreased in comparison to that of their Muslim neighbors. The CIA World Factbook reported that in 2014, while the Total Fertility Rate (TFR) of Russia was 1.61 the TFR of Tajikistan and Kazakhstan was 2.76 and 2.34 respectfully.33 These statistics underline the fact that Moscow will continue to undergo a demographic shift that favors the Muslim population. This change, due to Moscow’s dependency on the legal and illegal low-paid workers in the city, is inevitable. The effects of nationalism subsequent to the fall of the Soviet Union exposed a deep rift between Muscovite and outsider culture. These ideologies, which are based on regional ties and religion, created barriers between the cultures of Russians and others; therefore, any assimilation process was, and still remains, tempestuous. Moscow is unfortunately a prime example of this unfortunate phenomenon, and cultural bitterness continues to threaten stability within the region. Many Russians claim Muscovite history is irreconcilable with Islam; however, the modernizing Russian economy is in desperate need of the Muslim workforce entering the region. The claws of nationalism must be put away, as the new workforce in Moscow is to stay. “History & Culture of Russia / The Mongols and the Emergence of Moscow,” History & Culture of Russia, The Mongols and the Emergence of Moscow, http://www.geographia.com/russia/rush-is03.htm (accessed March 26, 2014). Shireen Hunter, Russia and Islam, (New York: M.E Sharpe, 2004), 28. Walter Laquer, “Russian Nationalism,” Foreign Affairs, (Winter 1992), 106. Edward Lazzerini, Muslim Communities Reemerge, (Durham: Duke University Press, 1989), 9. Shireen Hunter, Russia and Islam, 140. Walter Laquer, “Russian Nationalism,” 105. Shireen Hunter, Russia and Islam, 144. Shireen Hunter, Russia and Islam, 145. Domitilla Sagramoso, Violence and conflict in the Russian North Caucasus,” International Affairs (July 2007), 684. Shireen Hunter, Russia and Islam, 146. Domitilla Sagramoso, “Violence and conflict in the Russian North Caucasus,” 697. Simon Jeffery, “The Moscow Theater Seige,” The Guardian October 28, 2002, http://www.theguardian.com/world/2002/oct/28/chechnya.russia6 (accessed December 2nd, 2013). Alexi Malashenko, “Islam, the Way We See It,” Russia in Global Affairs 4 (2006), 34. John Russell, “Russian Demonization of the Chechens before and since 9/11,” The Third Quarterly, Vol 26. (Taylor & Francis, Ltd, 2005), 108. Roland Dannreuther, Russia and Islam: State, Society, and Radicalism, (Taylor &Francis, Inc, 2013), 87. “Moscow Population 2014,” World Population Review, http://worldpopulationreview.com/world-cities/moscow-population/, (accessed April 17th, 2014). Roland Dannreuther, Russia and Islam: State, Society, and Radicalism, 87. World Bank “GDP per capita (current US$),” Data, http://data.worldbank.org/indicator/NY.GDP.PCAP.CD/countries (accessed March 26, 2014). “Working in Moscow,” InterNations, http://www.internations.org/moscow-expats/guide/working-in-moscow-15439 (accessed on December 4, 2013). “Unemployment Data for Republic of Chechnya,” Unemployment Rate in Republic of Chechnya, http://unemploymentinrussia.com/republic_of_chechnya.aspx (accessed March 26, 2014). Rustam Quobil, “Moscow’s Muslims find no room in the mosque,” BBC News, http://www.bbc.co.uk/news/world-europe-17436481, (accessed on Deember 8, 2013). “History & Culture of Russia / The Mongols and the Emergence of Moscow,” History & Culture of Russia, The Mongols and the Emergence of Moscow, http://www.geographia.com/russia/rushis03.htm (accessed March 26, 2014). Amir Taheri, Crescent in a Red Sky, (London: Hutchinson, 1989), xi.28 “President of Russia.” President of Russia. http://eng.kremlin.ru/news/5747 (accessed April 17,2014). “Thousands march on Moscow in anti-muslim migrants protest.” Vanguard News, http://www.vanguardngr.com/2013/11/thousands-march-moscow-anti-muslim-migrants-protest/ (accessed December 8, 2013). Murat Sadykov, “Central Asia: Labor Migrants Caught in Russian Politicians’ Crosshairs,” EurasiaNet.org, http://www.eurasianet.org/node/67135, (accessed on December 4, 2013). Zeynalov, Orhan . “Migrant Worker In Russia, Detained As Suspect In Killing That Sparked Riot,” The Huffington Post, http://www.huffingtonpost.com/2013/10/15/orhan-zeynalov-russia_n_4101237.html, (accessed on December 9, 2013). Alexandra Odynova, “Migrants on High-Alert Following Moscow Riots,” Equal Time, http://www.equaltimes.org/in-depth/migrants-on-high-alert-following-moscow-riots (accessed on December 6th, 2013). Central Intelligence Agency, “The World Factbook” https://www.cia.gov/library/publications/theworld-factbook/rankorder/2127rank.html (accessed April 16th, 2014).